We love taking advantage of various seasonal ingredients and pumpkin is definitely one of our favorites! This cheesy pumpkin dip is a tasty snack that is perfect for entertaining or hanging out with the family on game night; it’s like the cool, older sibling to your run-of-the-mill cheese and crackers! You can make it on the stove or in a food processor (we prefer melting it down so it’s gooey and delicious), and with it you’ll never be at a loss for what to serve when you need a quick and fun dip recipe! In a medium saucepan over medium-low heat, melt and blend together your cream cheese and cheddar cheese. 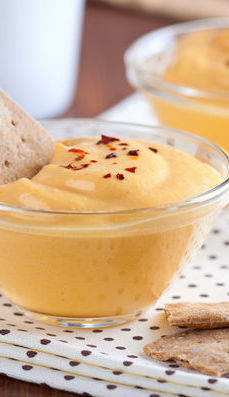 Stir in pumpkin puree and mix well. Add in cinnamon, salt and pepper. Pour into heatproof serving bowl and garnish with peppers. Serve with crackers.